Home > ASG > ASG Magazine Steyr AUG A1/A2/A3 45 Rounds. 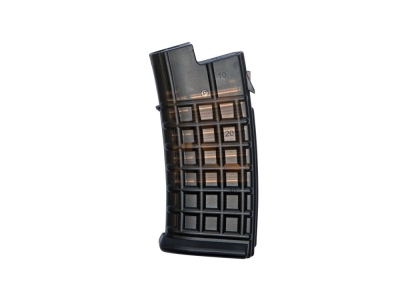 ASG Magazine Steyr AUG A1/A2/A3 45 Rounds. Affordable low-cap magazine for all our Steyr AUG models. This magazine will ensure a consistent feed of BB’s due to its spring-fed canal. It is made from strong polymer and is very durable. The outer casing is translucent with dummy cartridges clearly visible, give the appearance of the original firearms magazine. Great for mil-sim and collectors.